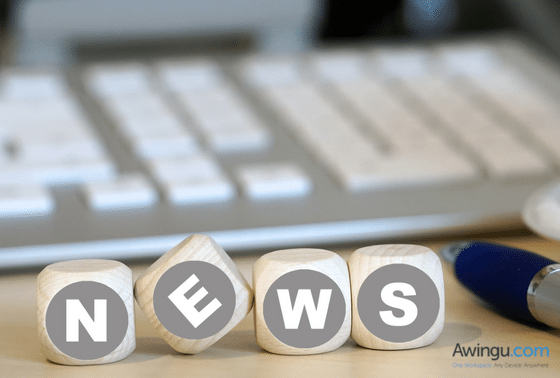 IRVINE, CA–(Marketwired – December 11, 2015) – Awingu, a developer of online workspace aggregator software, today announced the launch of Awingu 3.0, the latest version of the company’s online workspace that offers a new user experience, a mobile app for tablets, and expanded administrator tools and features in order to help businesses deploy simple, web-based mobility. Awingu software aggregates all company files and applications to one secure online workspace that can be accessed from any device, OS or browser, and is a fast and easy way to simplify enterprise mobility without disrupting the way IT is currently run. Version 3.0 builds on this simplicity with a new, completely redesigned user interface that was developed using feedback from partners, customers, and other IT experts. Awingu 3.0 is now available on an Android, iOS, and Windows app for tablets and offers expanded administrative tools for greater insights and control. The online workspace also offers new features such as multiple backend authentications and multi-active directories to help enterprises like service providers deliver a wide range of hosting services. Additionally, it now integrates SSL (Secure Sockets Layer) offloading for greater IT efficiency and cost savings. Designed to leverage the power of web technology, Awingu works with any cloud services or IT infrastructure and can connect to any application independent of where it runs, for example, SaaS such as Office 365, or legacy applications like AS400. It never leaves a data footprint and all confidential files remain secure, whether on-premise or in the cloud for a safe and secure way to implement BYOD. File sharing only requires sending an URL for real-time editing, and personal or corporate devices do not require any software installation for hassle-free collaboration.